AriScope is an ARINC 429 Bluetooth® interface for an Android Smartphone. It enables the acquisition and analysis of each received bit at both High Speed and Low Speed in real time. The associated AriScope Android application displays the list of the received labels with individual refresh rates, detailed information and an oscillogram of a selected label. AriScope is also able to record the whole activity of the line into a text file that is sent immediately by e-mail from the application. The battery powered device has a small size and is very simple to use (no cable). With a fully charged 18650 lithium battery, the runtime is over 50 hours. AriScope is shipped with a 18650 battery and a charger. The AriScope application can downloaded for free in the Google Play Store: Download AriScope. 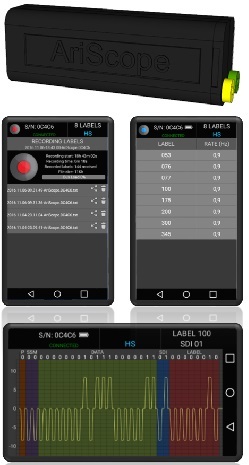 The new version is available: it enables label decoding in real-time from a descriptor file that is simply dropped into the corresponding folder on the Smartphone (see datasheet). Unit price: 1200 euros VAT excluded with a 1 year warranty. See the AriScope documentation for more details. To place an order, please contact NAVEOL ("Contact" section of this website).